One of the best parts about having Ray take care of Levin (without me there) is the surprises I find from it. 1. These pictures Ray took of Levin. One of the women from the meeting had her little girl with her and the little girl kept wanting to see what the baby was doing. 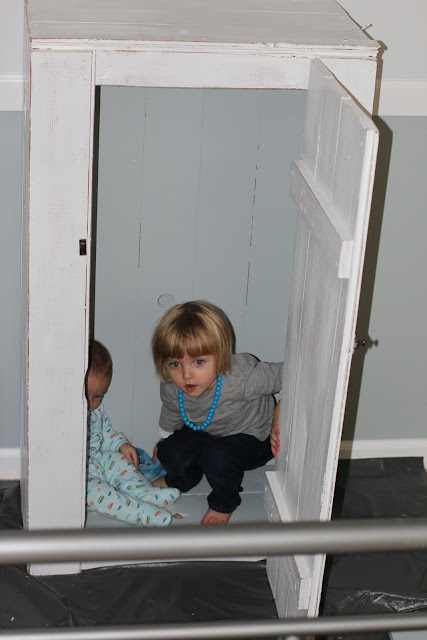 They found this old cupboard I had painted the day before and spent the rest of the time playing in it. Levin is a REALLY awesome friend. He's a good listener, doesn't interrupt, and pretty much just plays along with anything. 2. These socks I found on the next morning when I went to give him his bath. They were on under his pajamas. I'm not sure if this is what Ray was thinking, but I imagine he was getting Levin dressed in his pajamas and pondered, "am I supposed to take these off or leave these on?" Last time I was gone, Ray taught Levin how to hold his own bottle. maybe i'm just the crazy sock mom...but i always left my babies socks on under their jammies. I still sometimes do with Bridger if I know it is going to be a particularly cold night. And when I see babies in the stores with no socks or blankets my heart always hurts a little. I want to go bundle them up. yep I think i am the crazy sock lady! the cupboard playing is adorable. I used to find socks on Carter under his pajamas too. Bo would say he just didn't notice that Carter had socks on. I love it. I think Levin makes a great playmate too. And you're so right. He does listen, doesn't interrupt, and goes wherever we take him. Oh Cali, It has only been a few weeks. Come back, come back, oh please come back. Kiss Levin for me. Have a great day today as a family! Greg always leaves their socks on too. Levin is so very adorable and looks so much like you! Haha. I love your blogs. They are funny. And I love Levin. He's pretty funny too.